The headline appears on the Drudge Report tonight. The United States Federal Government is pushing closer to waging war against the Nation of Iran. President Obama spoke yesterday in Israel concerning Iran’s nuclear program. Now the question should be asked why is the United States so interested in a nation of 75 million people 6000 miles away its shores? I’m sure it has nothing to do with the fact that Iran is sitting on the 2nd largest natural gas reserves and fourth largest petroleum reserves in the world? The United States has been interested in Iran for a long time and it has always been about the oil reserves. During WWII the U.S., Brittain and Russia were very much involved in keeping Iran out of the Nazi fold because of their oil reserves. The British in particular were deeply involved in oil production in Iran during and after WWII. This was very profitable for the British exporting the oil out of Iran but left the Iranian’s mostly impoverished. The Iranians were not happy with the British contracts and were seeking in the early 1950’s to Nationalize the Petroleum Industry in Iran. This would have left the British Oil companies in a bad spot. What did the British do? Did they negotiate with the Iranians or cut their loses and move on? No. They called the White House. Eisenhower approved helping the British overthrow the government of Iran and “Operation Ajax” was born. Winston Churchill had reminded the U.S. that the British were helping the U.S. “combat communism” around the world and for their continued cooperation all the U.S. had to do was to stage a little coup in Iran. The U.S. CIA and British MI6 did just that. They launched Operation Ajax to overthrow the rightfully elected Prime Minister, Mossaddeq. In Mosaddeq’s place the U.S. backed “Shah” was installed and reigned for 25 years. His unpopular rule ended in 1979 when the people of Iran performed their own “coup” and created the “Islamic Republic”. The seeds planted in 1953 by the CIA and MI6’s murder, deception and subterfuge in overthrow of Iran’s government led directly to the 1979 revolution. Ever since the 1979 revolution, the United States has had economic sanctions against Iran. In fact over the last decade they have become more and more severe. It must be remembered that sanctions are never against governments. They are always against individuals. They always lower the standard of living for individuals living in both countries involved. If the sanctions were lifted on Iran today gas prices would fall about 10% in the U.S. and much-needed cancer medicine would be readily available in Iran. The question we must ask is: Who benefits from these higher gas prices? I know it is not you and me or the people of Iran. Today the sanctions against Iran are meant to encourage a regime change from within by causing massive pain to its citizens. The sanctions coupled with a contentious election in 2009 almost accomplished this. There were massive protests but the brutal regime suppressed them. More individuals didn’t join the protests because they blame the U.S. for the sanctions they continue to suffer under and look to their government to provide relief from them. If the U.S. stopped the sanctions the regime in power wouldn’t have any excuse for the lack of freedom and prosperity in the country. There have been some protests in 2011 and 2012 but not on the scale of those that took place in 2009. The sanctions remain in place, the Iranian Regime remains in power, and the gas prices in the U.S. are still 10% higher than they should be and people in Iran are dying because of lack of medicine. This is the legacy of government intervention around the world. The majority of individuals in both countries involved suffer for generations. I’m not a fan of the Iranian government. The guys in charge are horrible people who have done horrible things. If they weren’t in power that would be a good thing. But it isn’t the business of the United States government to decide what type of government another country has or who is involved in it or if they should have nuclear weapons or not. 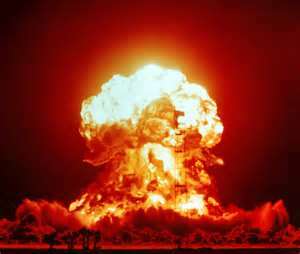 If Iran used a nuclear weapon against the United States what would really happen? All 75 million people in Iran would die in a retaliatory strike, that’s what would happen.That’s why mutually assured destruction worked during the Cold War (even though at the time we thought the Soviet leaders were insane), it worked. Those in power in Iran know this as well. The Iranian people after WWII were on the path to prosperity with a secular democratic government. This ended when the joint CIA/MI6 “Operation Ajax” overthrew the elected government in 1953. Just think what life would be like if Iran was a peaceful trading partner with the U.S. The individuals who live in both of the countries would be more prosperous today. Government intervention always leads to more problems and more government intervention. It is an endless cycle of misery, murder and war. Operation Ajax is the perfect historical example of the dangers of government intervention abroad and should inform the decisions of those advocating regime change in Iran and other countries around the world.